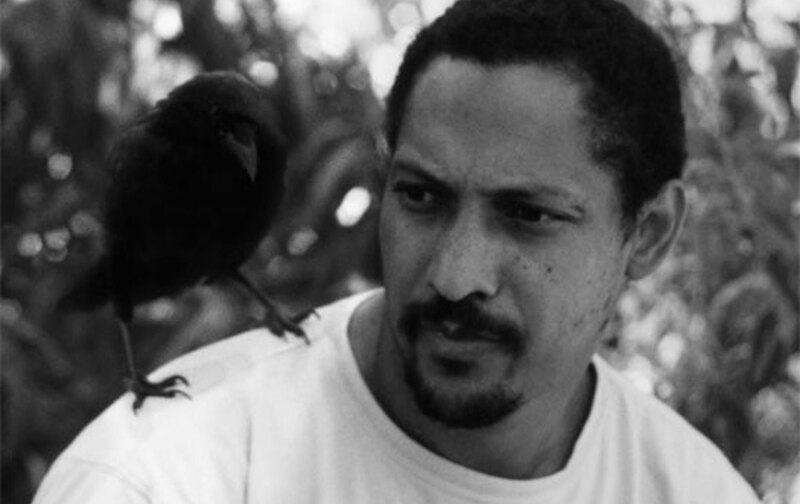 Percival Everett’s new novel is a meditation on seeing and abstraction, and it might be key for recognizing a new form of literary social critique. Everett’s new novel, So Much Blue, has dashes of his signature quirky comedy, but it’s not one of his roaring, monster-truck satires that soar through the air and crush their targets, as with Glyph (1999, on literary theory), Erasure (2001, on the cynical marketing of black pathology), or A History of the African-American People (Proposed) by Strom Thurmond (2004, an epistolary novel written with James Kincaid). Nor is it one of his hilarious formal experiments, such as I Am Not Sidney Poitier (2009, about a ringer for Sidney Poitier named Not Sidney Poitier), or his fun—if somewhat manic—study of storytelling, Percival Everett by Virgil Russell (2013). Nor is it much like his darker novels, such as The Water Cure (2007, about torture) or Assumption (2011, a fine detective yarn with a shocking twist). So Much Blue is the story of a man—an average one, except for his talent as a painter—coming to terms with his past in the hopes of creating a better present for his wife and children. Kevin Pace is the narrator and protagonist, introduced in the midst of a crisis, in 2009, at the age of 56 (“if I died today everyone would comment on my youth and yet if I broke my leg trying to leap the back fence everyone would call me an old fool”). There are three strains on his psyche that are affecting his marriage: an incident that occurred in El Salvador in 1979, before he got married; an affair that he had in France in 1999, with a woman much younger than his wife; and his daughter’s choice to confide something personal to him rather than to his wife. A giant mystery canvas in Pace’s detached studio is the subject of speculation, in his family and in the art world at large (which is not subjected to as much satirical attack as might be expected from Everett). The questions raised by this painting—what it is, how it is, and what it does or does not mean—as well as their tentative answers are intertwined with Pace’s gradual transformation from a tormented enigma (in the eyes of his wife) to a better husband. ‘So Much Blue’ is a meditation on abstract art as social critique, and in that way, the novel could not be timelier. More than the story of a man and his family, though, So Much Blue is an extended meditation on seeing. Pace is an abstract painter who is also African-American, and in that way, the novel could not be timelier. In March, much controversy swirled around Dana Schutz’s Open Casket, a painting representing the murdered Emmett Till, which was displayed at the Whitney Biennial. In June, Sam Durant’s 2012 sculpture Scaffold, which sought to comment on the mass executions of Native Americans in 1862, was dismantled and burned, following an agreement between the Walker Art Center in Minneapolis and the local Native community, before the exhibit even opened. In 2015, the conceptual poet Kenneth Goldsmith, in a quest to extend his practice of “uncreative writing,” read aloud a poem titled “The Body of Michael Brown,” in which he used text from the Ferguson teenager’s autopsy report. Protesters against these works have argued that the use of black and Native tragedy as source material by white artists represents an appropriation of real trauma—manifestations of white supremacy, not attempts to confront it. Endeavoring to make art from another person’s pain isn’t the same as cultural appropriation, but such pursuits, as generally conceived today, share a relationship to notions of identity-based ownership—of certain histories, certain cultural expressions. But while a different culture’s history shouldn’t be declared categorically off-limits to an artist, there are meaningful questions of quality, context, understanding, power, and purpose to be considered—and, along those lines, each work of art must be evaluated on its own terms. As a result, So Much Blue almost feels like an invisible bridge between the chapters of Harper’s book. An abstract painter has to give up on his medium to tell a story: Harper would dig the thesis. Indeed, Kevin Pace has to narrate his story for optimal impact. In the case of his story, he doesn’t see fit to say: Here’s my painting—figure out what I want for it to communicate to you. As Harper asserts, “Our objective must be both to reassert literature as a prime focus of African Americanist commentary and also to reconceive literature as a much more capacious category than African Americanist discourse has typically allowed. That domain right now affords scant leeway for the attenuated characterization, referential indeterminacy, and rhetorical repetition that typifies…the no-doubt-numerous works that have flown under the realism-attuned radar; and yet those features are the ones from which we might benefit most.” One could argue that attenuated characterization, referential indeterminacy, and rhetorical repetition are three of Everett’s specialties, at least in his satires. Despite Harper’s advocacy for literature, it might be helpful to visualize the structure of So Much Blue as a painting. Containing 17 chapters set in 1979, 15 in 1999, and 22 in 2009—all jumbled together—the novel works like a shattered triptych, or perhaps like an elaborate game of three-card monte, with secrets revealed every so often. The technique is effective, and the rhythm that develops keeps the pages turning. With this temporal cutting and jumping, Everett revisits a method that he used in his first novel, Suder (1983), a provocative and surrealist dark comedy that can stand alongside his best work (and among the best works of American literature in the late 20th century). Suder, in which chapters taking place in the Pacific Northwest in the early 1980s are shuffled with chapters taking place in North Carolina in the 1950s, is narrated by Craig Suder, a washed-up Major League Baseball player and one-time slugger for the Seattle Mariners. After an unexpected run-in with racist violence following a game in 1981, Suder has a breakdown, tries and fails miserably to replicate the work of Charlie Parker on an alto saxophone, and, finally, after a series of bizarre adventures involving a pet elephant, a Maoist collective, and a drug deal on the high seas, builds a set of wings and takes flight over rural Oregon. Everett has a knack for a sort of deadpan first-person narrator who perceives the world with a subtle undercurrent of bewilderment. But while So Much Blue is a well-crafted novel—the El Salvador chapters are particularly vivid—it lacks the mysterious spark that propels Suder. Kevin Pace is a Craig Suder who doesn’t have the energy (or the requisite craziness) to give up his old life and try for a new one. Pace cheats on his wife with a young art student in France. He feels kind of guilty about it, but not really… well, sort of… sometimes, he doesn’t know. He eats two foil-wrapped hot dogs for lunch every day and is obsessed with the CIA, an obsession that comes out at odd moments. So at least the novel features some good old Everett weirdness. Yet ultimately, So Much Blue feels behind the curve in terms of the kind of stories that have contemporary urgency. Pace’s problems are convincing but not especially compelling: He’s a well-off man, with a nice family and a nice life, who happens to be sad. He did something once in El Salvador when he was 24—it’s in a moral gray area—and it’s still bothering him. He reconciles with it, more or less, after another trip to a very different El Salvador (one that seems to be benefiting from globalization). Sometimes Pace’s problems feel self-indulgent. The most privileged person can certainly be tormented by real problems, but despite its moments of brilliance, this is not a novel I would have finished if it had not been written by someone named Percival Everett. Abstract as it was, it was essentially a time line, simple as that, but time didn’t move along it, there were no intervals, nothing changed, accelerated, or stopped. The fact that it was secret served its secrets, my secret, and suddenly I understood at least one rather simple and perhaps obvious forehead-flattening truth, that a secret can exist only if its revelation, discovery, even betrayal is possible. So Much Blue’s epigraph comes from Diane Arbus: “A picture is a secret about a secret.” And, indeed, the secrets about Pace that are revealed throughout the novel—his infidelity, his El Salvador thing, his daughter’s choosing to confide in him rather than her mother—may not be the book’s most secret secrets. “There is a cruelty in abstraction. It cuts into flesh. It relies on our fear of mortality for its meaning”—so Pace begins a discussion of the paintings he created upon his return from El Salvador. In other words, setting out to make an abstract work of art, if it’s meant to contain a social critique, requires a secret—and thus the pretense that one has a secret worthy of hiding. As for So Much Blue, its statement on abstract art by an African-American writer and artist requires some work, too: Why is it, how is it, what does it mean or not mean? The process of piecing together this shattered triptych may yield a rich reward. Paul DevlinTwitterPaul Devlin is the co-editor of the Library of America’s definitive editions of Albert Murray’s work (volume one: 2016, volume two: 2018), and the editor of Murray Talks Music: Albert Murray on Blues and Jazz (2016).